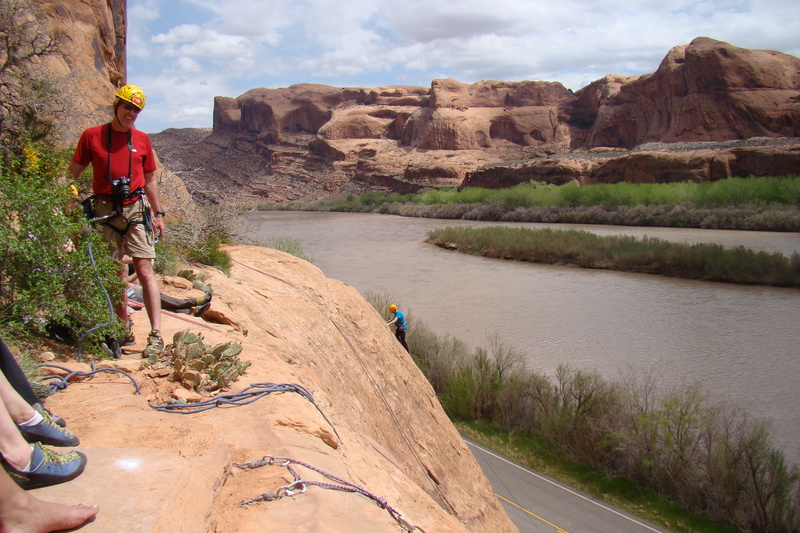 Last week I had the unique opportunity to participate in First Descent’s (FD) first climbing camp of the 2010 season in Moab, UT. I was fortunate to be able to assist FD staff in supporting the cancer survivors. It was life changing for everyone there. The FD staff provided a natural and attentive approach to cancer survivors at various stages of recovery. The environment in camp allowed campers to comfortably push past physical as well as mental limits. 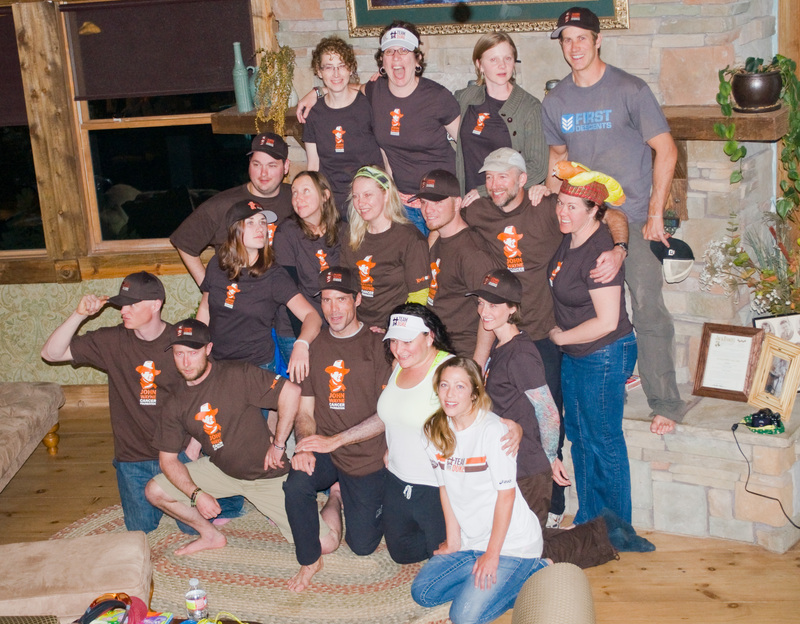 JWCF helped fund this cancer survivor camp and has been funding FD each year since 2007. 88 pitches in one day! Thank you to all of JWCF’s donors and Team DUKE athletes for making it possible to support these cancer survivors. 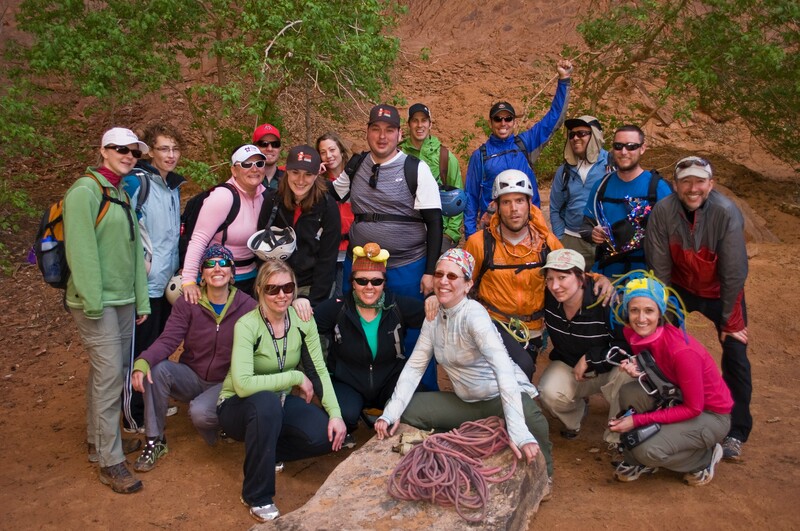 And thank you to everyone involved @ at the FD camp in Moab for an incredible experience. 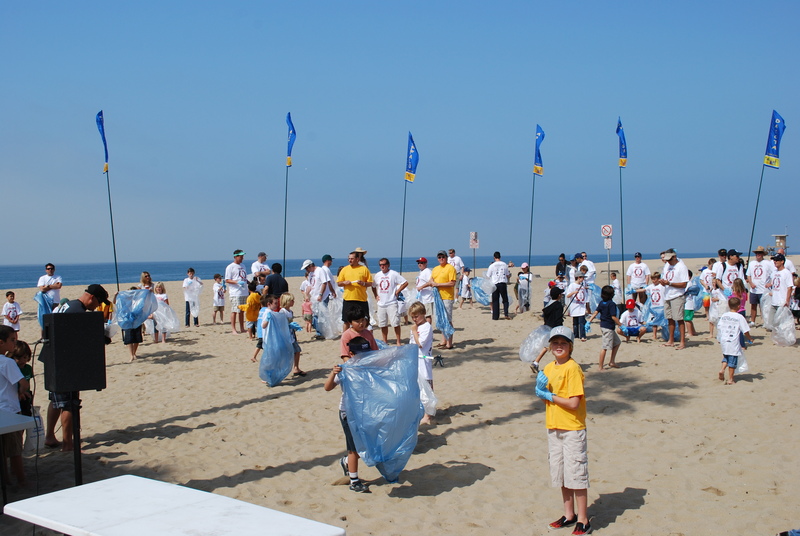 Volunteers from Spot a Spot. Save a Life! 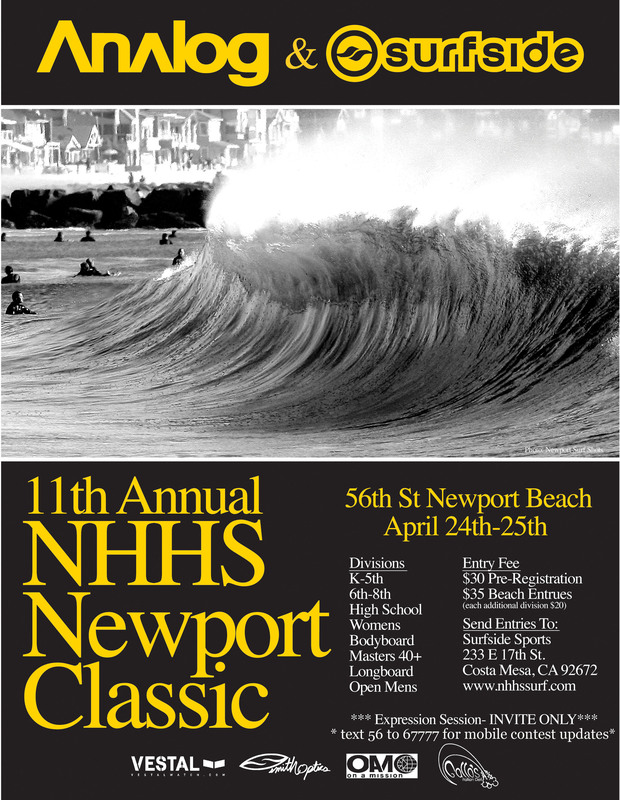 helped provide skin cancer education to the people who attended the Newport Beach clean up (YMCA Dolphin Nation Y Guides) and the 11th Annual Newport Classic surfing competition that was put on by the Newport Harbor High School Surfing Team. JWCF helps fund Spot a Spot. Save a Life! The volunteers passed out JWCF sunscreen and showed people photos of melanoma so they know what to look for in between check ups. Also, JWCF provided sunscreen samples to the first annual Hovie SUP Paddle Festival www.hoviesup.com. 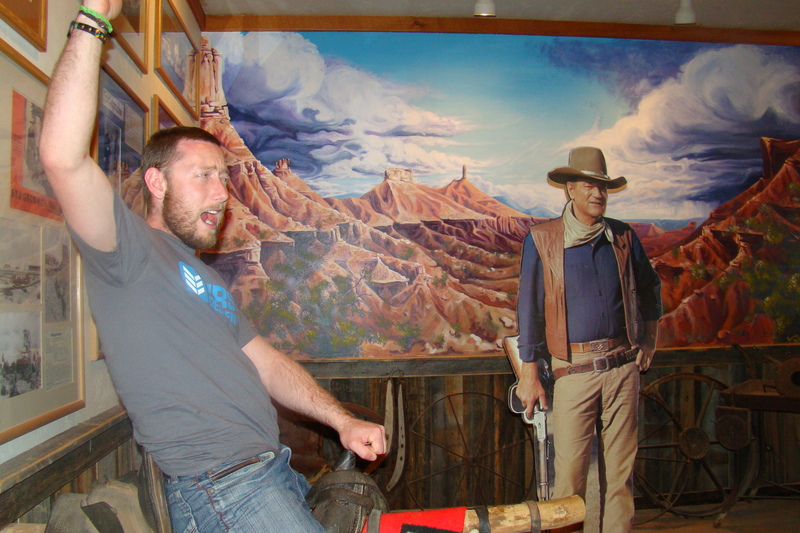 And to top it off, the Newport Beach Film Festival showed Stagecoach starring John Wayne. 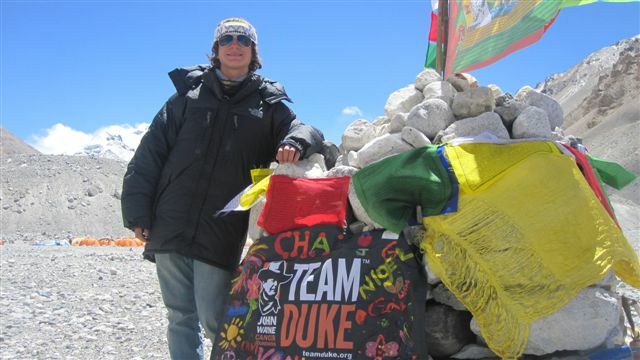 Jordan plans to take a Team DUKE summit flag to the top of Mt. Everest. The flag was decorated by child cancer patients and their friends and family through the Children’s Healing Art Project. The names of the children are on the flag. The John Wayne Cancer Foundation helps fund the Children’s Healing Art Project, an organization that brings the healing power of art to child cancer patients. The weather was beautiful, and everyone was enthusiastic. We are road bikers, cross country mountain bikers, commuters, bmxers, downhillers, unicyclers; we are Sea Otter and everyone had a great time together. It is amazing that this many people converged in one place to ride, shop and socialize. The overall feeling was unified competition and we used this opportunity to invite people to join and support the fight against cancer. I’d like to dedicate this race to “Crash” from the Bootleg Extreme XC race, as I was informed by his friend that he recently passed. He worked with JWCF to get sunscreen to his racers in hopes that they wouldn’t have to go through the same experience he did with skin cancer. Crash’s friend commented that Crash is building tracks in heaven. Thank you to everyone who joined and supported Team DUKE during the 4 days of events, everyone who visited the booth, and to all the cycling vendors/companies and Sea Otter staff and volunteers. 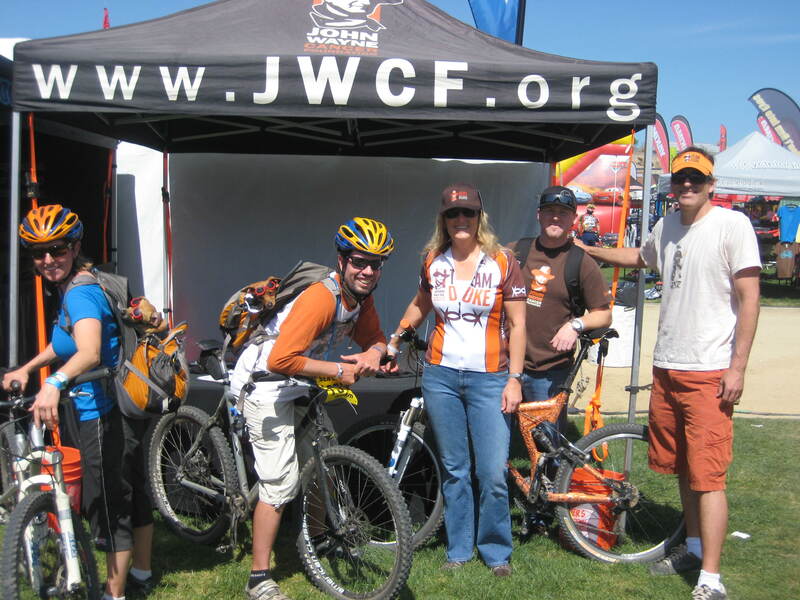 Team DUKE would like to thank all the riders for representing JWCF in the fight against cancer. Racers and riders including but not limited to: Team DRD/Tomac (Dylan Dean and the the team), Team BikeBling.com (Mike and the team), Team Newport Beach Composite high school mountain bike team (Jesse, Leila and Alex and their parents), Team Los Laureles Lodge in Carmel Valley (Mike, Les, Jamie and Julie), the Noble family. Congratulations to Leila for earning 2nd place in Super D!!! The cross country track was perfect. Team DUKE would like to thank the Children’s Healing Art Project for partnering with us to bring the healing power of art to child cancer patients and their family and friends and to give riders the opportunity to show their support. The Bling Bike that the child cancer patients and their families and friends decorated inspired a lot of people as it was displayed at the booth and raced on the course. Hundreds of people were drawn to touch the bike and then when they heard the story about who decorated the bike and the significance of it, many were moved to tears, as seeing, touching and hearing the story about the children and the bike made a strong impression on them. Team DUKE would like to thank Jason and Jackie from Ideavise (marketing, branding, graphics) for volunteering at the JWCF booth. JWCF was fortunate to be located next to the good folks from H2O Overdrive again :). Team DUKE would like to thank the Los Laureles Lodge; a great place to stay that is operated by cyclists! We handed out thousands of sunscreen packets to exhibitors, riders and their families as part of our skin cancer education program. We were able to help out one of the road rides with sunscreen as well. We also passed out the A, B, C, D’s of melanoma book markers to encourage people to get skin cancer check ups and to do self checks in between appointments. Just a few of the great people we saw: Easton, US Cup, SoCal Cross (Dorothy and Jeff and team), So Cal Interscholastic Cycling League (high school mountain biking), Cog Wild bike tours (go Melanie), Voler, Maggie from Luna, Team Bear Valley Bikes!! !, Fox Racing Shox, Cal Poly students, Eric from Ride for the Roses, Great Chiweenies, Tonya from Mtn. Bike action, Garmin, Camelbak, Crank Bros. and Garrett. Thanks to Cambria Bicycle Outfitters for finding and selling me a multi tool in the early morning just before my race that allowed me to repair a loose frame bolt half way through my race :). Put it on the calendar for next year, you’ll be glad you did.